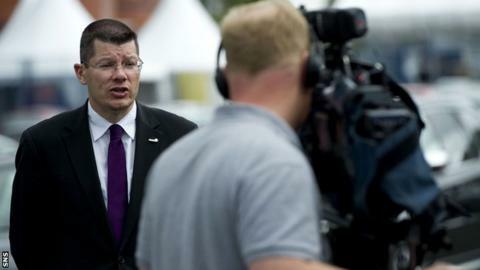 Neil Doncaster is calling for Scottish Premier League fans to turn out in greater numbers ahead of the new term. The league's chief executive remains tight-lipped on the value of new broadcasting deals, warning only of a "slight" reduction. "Whilst the money is not as high as we would have hoped, there is still some security," he told BBC Scotland. "The numbers are down slightly and it's really for clubs to try to maximise income through the gates." ESPN have followed Sky Sports in announcing a five-year agreement with the SPL that also allows them to broadcast Rangers games in the Third Division. The broadcasters had been due to sign a £16m annual contract to replace their £13mi-a-year deal this summer, but the collapse of Rangers had given them an exit clause. "There will be money coming out the game as a result of Rangers not being in the top flight," explained Doncaster. "We will not be announcing figures at this stage. There will be a seven-figure sum that we will be short. "There is significant damage done, particularly to the overseas rights, and it's up to clubs to try to fill that gap. "Certainly there will be some financial hardship, these are not easy times. "There's a financial gap that clubs have to work with." Doncaster had come in for criticism following his dire predictions for the financial future of the SPL if the relaunched Rangers were not admitted to the top flight. He repeated the same concerns when the new club sought a place in Division One. But he defended his worst-case scenario warnings, saying: "If we hadn't pointed that out it would have been irresponsible. "We have been able to work with broadcast partners and bring money in. "Ultimately the confidence broadcast partners and the world at large has in Scottish football has shone through. "They had the right to [walk away] and that's why we were clear that could be a possible consequence. "As it is both Sky and ESPN have stood by Scottish football." Doncaster then rejected speculation that any deals were being done to accelerate the Ibrox club's progress through the divisions. "The broadcasters have made no stipulations about any particular club and where they might be within the league structure," he said. "We have agreed a way forward that reflects the fact Rangers are not in the SPL." Doncaster also dismissed accusations from Rangers manager Ally McCoist that the SPL had "as hostile an agenda as possible" towards his club. "We have always made it clear we treat every club equally," he explained. "You would have to talk to him to understand what he meant. "Certainly in terms of what we do at the SPL, it's all about the rule book. The clubs set the rules and we apply the rules without fear or favour to any club."